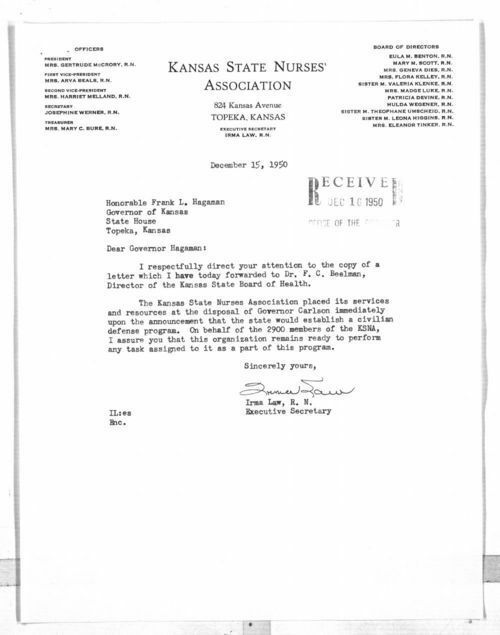 Irma Law, Executive Secretary of the Kansas State Nurses' Association (KSNA), of Topeka, Kansas writes Governor Frank L. Hagaman, also of Topeka, concerning the founding of a state civilian defense program. Law volunteers the services of the KSNA and its 2900 members in support of civilian defense. Law encloses a letter she wrote to Dr. F. C. Beelman, Director of the Kansas State Board of Health on the same issue. Law's letter follows the initiation of a United Nations' police action against North Korea in which the United States military played a dominant role. The Korean conflict further strained the already fragile relations between the U. S. and the communist Soviet Union and China. This "cold war" increased fears of a possible atomic world war and renewed interest in domestic programs for civilian defense.